Rabbi Aryeh Stern was born in 1944 in Tel Aviv, and studied at the HaYishuv HaChadash yeshiva, led by Rabbi Yehuda Kolodetsky. Stern then moved to the Hebron Yeshiva in Jerusalem, and after a short while to the Mercaz HaRav Kook yeshiva, following his rabbi who served as its head, Rabbi Zvi Yehuda Kook. After Rabbi Stern married, he commenced his studies for dayanut, Jewish-religious judgeship, in the Tel Aviv kolel of Rabbi Ephraim Bordiansky, who also instructed Rabbi Shlomo Zalman Auerbach. Rabbi Stern fought in the Six-Day War in the Combat Engineering Corps, and in the Yom Kippur War. 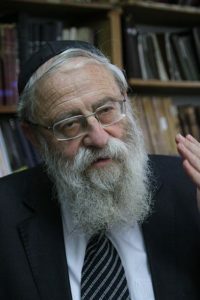 Rabbi Zvi Yehuda Kook appointed Rabbi Stern and Rabbi Yochanan Fried to establish the Halacha Brura and Berur Halacha Institution, which Rabbi Stern has since run. The Halacha Brura was one of the chief works of Rabbi Abraham Isaac Kook, the father of Rabbi Zvi Yehuda Kook. The institution is known for its method of Talmud study, first developed by Rabbi A.I. Kook, in which the final Halachic opinion of Maimonides and the Shulchan Aruch is summarized, alongside the approaches of other commentaries. Following the passing of Rabbi Zvi Yehuda Kook in 1982, Rabbi Stern was appointed a teacher in the Mercaz HaRav Kook yeshiva. He also serves as a lecturer in other yeshivas, which have included Yeshivat HaKotel, Kiryat Shmona yeshivas, Yeshivat Or Etzion, and Yeshivat Hesder Petah Tikva. Rabbi Stern was the head of Hadrom high-school yeshiva in Rehovot, and was one of the founders of the Ma'aleh Television, Cinema and Arts School for the religious-national sector in 1989. In addition, he has been instrumental in the organization of Rabbi Abraham Isaac Kook's House in Jerusalem, an active museum of Rabbi Kook's life, and in the establishment of the Merchavim Institute for training teachers and religious educators. Over the years, Rabbi Stern has written hundreds of Halachic responsa and religious-philosophical articles regarding Jewish thought. Alongside his religious and educational activities, he serves as a congregational rabbi at the Har Horev synagogue in the Katamon neighborhood in Jerusalem. Rabbi Stern was elected Ashkenazi Chief Rabbi of Jerusalem on October 22, 2014. The position had been vacant for eleven years following the passing of the former Chief Rabbi of Jerusalem.